When you buy a chicken coop, it comes standard with 14 gauge vinyl coated wire, creating a 1" x 2" hole size. 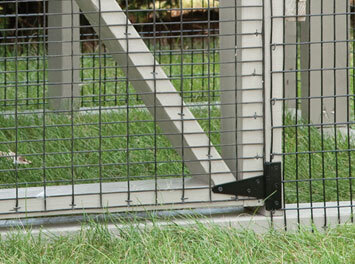 The vinyl coating on the wire prevents rust which means a longer life for your chicken coop. If you have a wide variety of pesky critters around, it is recommended to upgrade your chicken coop wire. The reduced hole size prevents even the smallest of critters from entering the chicken coop. Not sure which option to choose? Just give us a call at 717-553-0215 and we'll be more than happy to help you choose the best wire option for you.